Do not venture out in the moonlight on January 1st. If you see your shadow, it’s a sure sign that death will come before the next New Year! Whatever you do, don’t leave the house on New Year’s Day until someone else has entered, or misfortune will beset you. Wait for a visitor – preferably a dark haired man – for the best of luck. If you do go out, and if you should encounter a black cat, don’t worry. It’s actually a sign of good things ahead – but this is only true on New Year’s Day; no other. So goes New Year’s lore. More conventionally, New Year’s is a time for reflection; one year ending, another beginning. That’s how James H. Mills summed things up in a Virginia City newspaper editorial, closing out 1866. 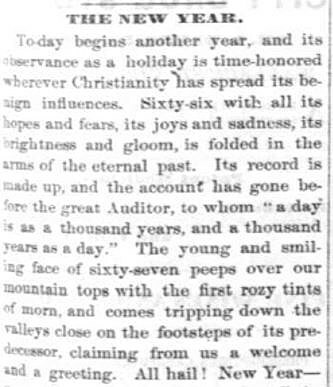 The editor of the Fort Benton Record chimed in a decade later writing, “The year 1875, with its joys and sorrows, hopes and despairs, misfortunes and successes, is completed, and we enter this morning upon the new year of 1876. “To many this New Year’s Day will be one of pleasure, to others it will bring no enjoyment, but to all it should be a day of reflection. “Let the merchant reflect whether there are not other objects in life as well as that of accumulating money; let the farmer consider whether he has not wasted many of the precious hours not required by his honorable profession. “Let the politician ponder whether he has labored more zealously to further his own pecuniary and other interests than to advance the general welfare of the people; let the priest and minister think whether they have faithfully and effectively discharged the duties of their sacred offices. 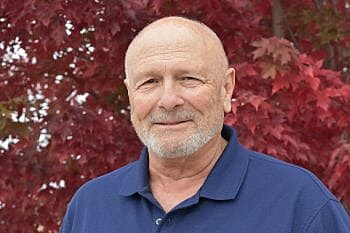 “Let the journalist turn to the files of his paper and say whether the thoughts there expressed were his own honest convictions, whether they were calculated to improve the mind and elevate the morals, or to cater to depraved tastes and encourage vice – let all pause for reflection before commencing the enjoyments of this day, before entering upon the cares and responsibilities of another year; for a moment’s seasonable reflection may save us years of useless regret. 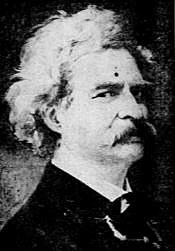 Perhaps one of the best-known New Year’s Day notes was penned by Mark Twain in 1863. “Now is the accepted time to make your regular annual good resolutions. Next week you can begin paving hell with them as usual. “Yesterday, everybody smoked his last cigar, took his last drink, and swore his last oath. Today, we are a pious and exemplary community. “Thirty days from now, we shall have cast our reformation to the winds and gone to cutting our ancient shortcomings considerably shorter than ever. “We shall also reflect pleasantly upon how we did the same old thing last year about this time. Harmless? Of no particular use? Maybe. But should you be a little superstitious, you might want to light a small bonfire at your doorstep. According to Welsh legend, the fire will “purify the house for the entrance of the new year.” Be sure to keep the ashes throughout the year. They are said to possess “special medicinal virtues,” very helpful should you suffer “falling sickness” or fits. Happy New Year – and may you not see your shadow!